Whisperdamp NW (Noiseless Wood) is a range of structural plywood that integrates impressive vibration damping and sound transmission loss into your structural wood floors or enclosures. 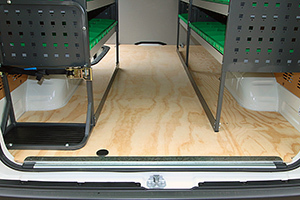 Applications: floors and partitions of transit vehicles’ such as busses and trains. Machinery enclosures, residential or commercial construction privacy walls, ceilings, floors, doors and mechanical spaces. Unlike standard plywood that is a very efficient radiator of sound; Noiseless Wood breaks the vibration transmission path by bonding two layers of thinner plywood together with a viscoelastic damping compound that allows the separate plywood layers to keep each other acoustically stiffer than they are as separate sheets. Lower surface vibration levels equal less transmitted noise to your ears and to the structure to which noiseless panels are mounted. *Request data sheet for detailed discussion. The two NW plywood sheets are chosen per application and finishing requirements. All materials utilize marine grade adhesives to assure a very long installation life. The plywood sheets are ideally equal thickness, but a good amount of asymmetry can be tolerated with minimal loss of acoustic properties. NW serves a dual purpose. It damps the resonant modes of the structure borne sound and is an efficient noise barrier. The NW replaces the plywood that would otherwise be used in the construction of the component, without any increase in thickness or weight. The acoustical deadness of NW is often sufficient to replace the need for additional heavily loaded polymer layers often employed to contain the noise radiation.